Dalton points from northeast Texas and Oklahoma. From Johnson, 1989, courtesy Texas Historical Commission. Distribution of Dalton points. From Johnson, 1989, courtesy Texas Historical Commission. Late Archaic (or early Woodland) dart points and stone tools from the Coral Snake site on the Louisiana side of the Sabine River in what is now Toledo Bend Reservoir. All of these artifacts made from local materials, mostly fossilized wood. 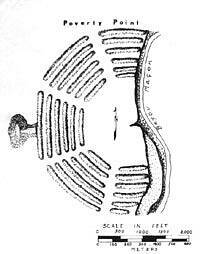 Early drawing of Poverty Point site in northeast Louisiana. The Poverty Point earthworks included a huge bird-shaped mound more than 70 feet (21 m) high and 710 feet (216 m) in length and a unique C-shaped array of raised berms arranged into six concentric and nested rings that are nearly three-quarters of a mile across (3,950 feet or 1.2 km) at the widest point. Petrified wood is one of the few materials suitable for making chipped stone tools that is found in the southwestern part of the Caddo Homeland (i.e., northeast Texas). 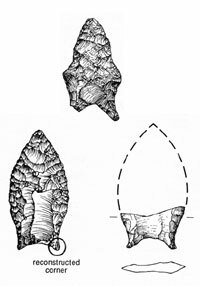 It was heavily used by Late Archaic times even though the resulting dart points and tools were rather crude by comparison to those made of flint (chert). These examples are from Cherokee County. TARL archives. Grooved stones such as these from the George C. Davis site were part of the tool-making kit of Late Archaic (and later) peoples in northeast Texas. The material is Catahoula sandstone, which outcrops in the area. TARL archives. Early to Late Archaic artifacts from the Wolfshead site in San Augustine County, Texas near the Sabine River in what is now Toledo Bend Reservoir. TARL archives. Excavations in progress at the Hurricane Hill site overlooking the South Sulphur River in Hopkins County, Texas. This site contained Late Archaic, Woodland, and Early to Middle Caddo components, although these were often difficult to separate. Courtesy Tim Perttula. The earliest peoples who lived in the area that would become the Caddo Homeland were highly mobile hunters and gatherers during the early Paleoindian era at the end of the last ice age (Pleistocene), some 12,000-13,500 years ago (10,000-11,500 B.C.). (A growing body of evidence suggests that there were earlier peoples in North America, but their impact is debated.) 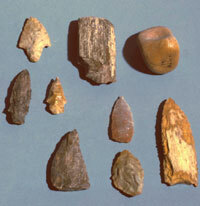 Early Paleoindian points including the Clovis and Folsom styles have been found in the area as have distinctive lanceolate spear and dart points dating to later Paleoindian cultures. By around 8,000 B.C. artifacts of the Dalton and San Patrice cultures are particularly common in the Southeast, suggesting that populations are growing and that different cultures were developing. Within the Caddo Homeland, evidence of Dalton culture is found mainly to the north, while that of San Patrice is mainly to the south. Beyond the region, Dalton points are concentrated in the Mississippi Valley and are especially numerous in northeast Arkansas. These contrasting patterns may reflect an early split between ethnic/linguistic groups. We don't know how this inferred split relates to later peoples. Nonetheless, we can speculate that the ancient ancestors of the Caddo-speaking peoples were among San Patrice rather than Dalton peoples, based on the geographic distribution of these early points. Dalton and San Patrice are considered by many archeologists to be among the first of many Archaic cultures in the Southeastern United States, named for the distinctive dart points made by their hunters. The entire Archaic period spans about 7,500 years between roughly 8,000 B.C. and 1000-500 B.C. The Archaic concept was originally proposed as a developmental stage during which mobile hunting cultures gradually became more settled and more reliant on wild plants, small game, and aquatic resources. In the broad sense, this view remains accurate, but we now realize that Archaic cultures were quite varied and responsible for many of the cultural developments once thought to date to the succeeding Woodland era. For example, permanent or semi-permanent village settlements, pottery, horticulture (gardening), artificial earthen mounds, and extensive, long-distant trade of exotic materials all appeared during Archaic times in various places in the Southeast. While most of the seemingly advanced Archaic cultures are known from areas hundreds of miles to the east and northeast of the Caddo area, some very important developments took place in the lower Mississippi Valley immediately to the east and southeast. For instance, in what is today northeastern Louisiana, Archaic peoples began building large earthen mounds as early as 4,000 B.C. These were not burial mounds and apparently served as platforms upon which people lived. At Watson Brake near Monroe, Louisiana, 11 mounds 3 to 25 feet (1-8 meters) tall are connected by ridges to form an oval enclosure over 850 feet (261 meters) across. The Archaic mounds of Louisiana are all located adjacent to now-abandoned river channels and were built by hunting and gathering peoples who exploited the local swampy environments rich in aquatic life including fish, fowl, and beast. In the same region around 1700 B.C., massive earthworks were built at the site of Poverty Point by peoples who depended on aquatic and riverine resources. The Poverty Point earthworks included a huge bird-shaped mound more than 70 feet (21 m) high and 710 feet (216 m) in length and a unique C-shaped array of raised berms arranged into six concentric and nested rings that are nearly three-quarters of a mile across (3,950 feet or 1.2 km) at the widest point. Poverty Point is thought by many experts to have been the center of a precocious society with far-flung trade connections as indicated by the finding of many artifacts made of exotic or non-local stone (some coming from sources hundreds of miles away). These exotic items may have been sent to Poverty Point in exchange for shell beads and ornaments, produced at Poverty Point and at linked sites on the Gulf coast. For reasons yet unclear Poverty Point culture had declined by 1000 B.C. and left no obvious successor. As far as we now know, the later Archaic peoples living in the Caddo Homeland did not build earthen mounds or form societies comparable to the one responsible for Poverty Point. Late Archaic groups in the region did participate at least indirectly in the Poverty Point trade network. This is known because a variety of artifacts have been found at Poverty Point that are made of materials such as novaculite and quartz from the Ouachita Mountains. But Late Archaic groups in the Caddo Homeland area seem to have been relatively small societies who were not closely connected to the main areas of the Eastern Woodlands where precocious developments were taking place. One such development was the beginning of plant domestication and horticulture (gardening). In the past few decades archeologists and ethnobotanists (specialists in how ancient peoples used plants) have demonstrated that at least four plants were domesticated in the Eastern Woodlands by 4,000 to 5,000 years ago (2000-3000 B.C.). Through selective manipulation squash, sunflower, marsh elder, and chenopodium (goosefoot) were all transformed from wild plants to crop plants with larger seeds and other desirable characteristics. The best evidence comes from only a few caves and open sites in the American Midwest that have extraordinary preservation conditions. The nearest one to the main Caddo Homeland is the Phillips Spring site in the Ozark Plateau of southern Missouri, less than 300 miles to the north of Red River. Domesticated squash and bottle gourd seeds found at Phillips Spring have been radiocarbon dated to at least 5,000 years ago. The discovery that these starchy and oily seed plants were being cultivated in Middle and Late Archaic times has shattered the traditional notion that the Archaic cultures of the Eastern U.S. were purely hunters and gatherers. Clearly, Archaic peoples were experimenting with plant cultivation and probably all sorts of other manipulations of the natural environment like selective clearing, spreading desirable plants to new areas, and so on. Archeologists are now reevaluating existing ideas about Archaic life. Were the Late Archaic ancestors of the Caddo also experimenting with gardening and growing starchy and oily seed plants? We don't know. The view here is that it is very likely that some Late Archaic groups in the Caddo Homeland area began experimenting with planting seeds obtained through trade and exchange from peoples to the north and northeast. But so far we do not have any "smoking gun" evidencepreserved domesticated seeds. This is at least partly due to prevailing preservation conditions and the lack of concerted effort to recover the needed evidence. This is a prime research issue in need of more work. What do we know about Late Archaic peoples in the Caddo Homeland? The Late Archaic period between roughly 2000-500/200 B.C. in the Caddo Homeland remains rather poorly known. Isolated and well-preserved Late Archaic site components (discrete deposits from a single period or use episode) are uncommon and not many have been studied. 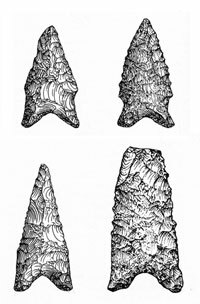 Nonetheless, Late Archaic-style dart points with expanding and contracting stems including, among others, the Yarborough, Ellis, and Edgewood types, are widely distributed throughout the area and, at many sites, are more numerous than earlier styles. In much of the region, Archaic lifeways seem to have persisted longer than elsewhere in the Eastern Woodlands. Compared to earlier periods, the Late Archaic seems to have been a time of higher populations and of more intensive use of the landscapesites are found on all landforms from major river terraces to upland ridges and everything in between. At some sites, particularly in valleys on the north side of the Ouachita Mountains and in the Great Bend area of Red River, refuse middens (essentially, kitchen trash dumps) begin to accumulate in Late Archaic times. The best known is the Wister phase of the Wister Valley in far eastern Oklahoma. There, "black middens" began forming in Late Archaic times. The Fourche Maline culture, in part, represents an intensification of this settlement pattern during the succeeding Woodland period. The presence of places with dense refuse accumulations in Late Archaic times suggests that people were becoming less mobile and staying in certain highly favorable localities for extended periods of time. Another interesting observation is that Late Archaic peoples were making extensive use of local stones to make tools. Why is this interesting? 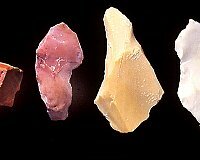 Because, except in areas such as the Ouachita Mountains, most of the local stones in the Caddo area are of poor quality and occur in small cobbles that are ill-suited to make nicely finished stone tools (such as dart points, knives, and wood-working tools). For instance, in parts of east Texas a commonly used material was fossilized wood. The fact that Late Archaic people were using such materials suggests two things. First, they weren't traveling far to find serviceable, if minimally so, raw materials. Second, there wasn't much trade with peoples in other areas (such as the Ouachitas or central Texas) who had access to plenty of high quality material. Late Archaic peoples in the area appear to have been hunters and gatherers as before, depending on a wide variety of mammals, fish, birds, seeds, nuts, berries, and roots. Deer was the most important large game animal, but the bones of many different critters are found in Late Archaic middens. There is some evidence for increased emphasis on the gathering and processing of nutsespecially hickory. While hickory nuts are tough nuts to crack, their oily meats are both flavorful and an important source of fat and protein. Evidence for the increased reliance on hickory comes from the large number of "nutting stones" (stones with small pitted cups that held hickory nuts securely during cracking) and the frequent recovery of charred nut hulls in Late Archaic sites. To extract all the fat, the cracked hickory nuts were probably stone boiled by dropping hot rocks into a nut and water slurry in tightly woven baskets or skin pouches (the fat is skimmed off the top). In the Cypress Creek basin in northeast Texas evidence has also been found for the use of rootsunderground tubers of the Psoralea family (common names include scurfy pea, prairie turnip, and breadroot). Preparing tubers for eating is a labor-intensive process. They had to be located, dug up, baked or boiled, and then dried (or eaten immediately). The two advantages of tubers are that they are available when nothing else is and that they can be dried and stored for later use. Putting all this together, across the Caddo Homeland area we see evidence of people settling down into localized territories and intensively using local resources, even those that were not particularly desirable. This suggests that regional population levels were high enough that there were no large unoccupied territories into which people could easily move in tough times. People started staying put or staying in smaller territories because their options were limited. While we cannot point to any one Late Archaic site and say with certainty, "This is where ancestors of the Caddo lived," we have little doubt that Caddo ancestors were already living in what would become their homeland. We also think that the conditions were set for the cultural developments that were to take place in the succeeding Woodland period. San Patrice points from northeast Texas and Oklahoma. From Johnson, 1989, courtesy Texas Historical Commission. Distribution of San Patrice points. From Johnson, 1989, courtesy Texas Historical Commission. 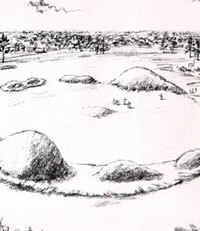 "Watson Brake Archaic Mound Site," an interpretive charcoal sketch by Martin Pate. 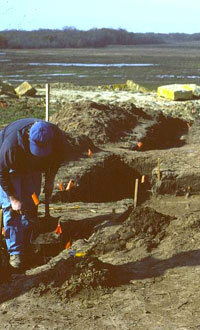 Courtesy National Park Service, Southeast Archeological Center. Flakes of novaculite from outcrops in the Ouachita Mountains of southwest Arkansas. Novaculite was quarried and used by prehistoric peoples in and near the Ouachitas for thousands of years. 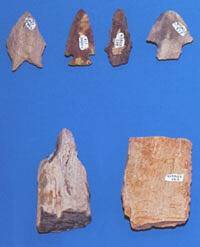 Artifacts made of novaculite are occasionally found in Archaic, Woodland, and Caddo period sites over much of the Caddo Homeland. TARL archives. Artist Terry Russell's depiction of a Caddo woman and her child collecting seeds from goosefoot (Chenopodium sp. ), one of the starchy seed crops domesticated in the Eastern Woodlands by 2000 B.C. Drawing courtesy of the Arkansas Archeological Survey. 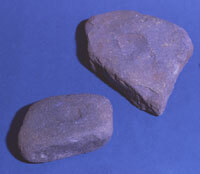 Nutting stones such as these from the George C. Davis site are common in Late Archaic sites. The material is ferruginous sandstone which outcrops locally. TARL archives. Hickory nuts were an important food throughout Caddo history and probably long before. 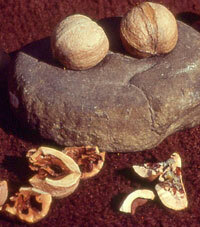 These tough-shelled nuts were high in fat and protein, but difficult to shell and extract. 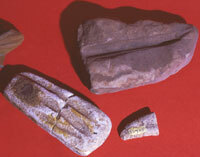 Pitted "nutting" stones, such as those shown here, are found in Archaic, Woodland, and Caddo sites. Photograph by Frank Schambach.